When I was in my late teens, I bought myself a calendar that was illustrated with vintage travel posters. I was particularly smitten with one for Cuba produced in 1949 by the Cuban Tourist Commission. 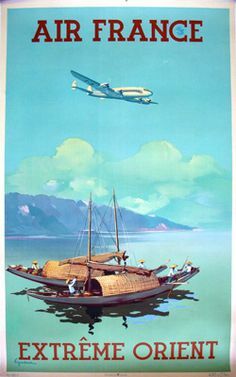 From that moment I formed a slight obsession with the beautiful artwork created to sell travel in the early days of advertising. Since becoming a graphic designer I’ve found myself asking “who are the artists behind these fabulous vintage travel poster designs? What was their process? Did they travel to all the places they illustrated?” So, I did a little research into these advertising industry pioneers and this is what I found. Modern posters were born in the mid-nineteenth century when a few planets aligned. The first was the development of printing technology, which allowed for mass production of colour images. The second was countries such as France lifting government censorship of public places. Lastly, mass-produced consumer goods were being advertised in populated urban environments. By the late nineteenth century, posters had hit their stride in Europe with many fine artists such as Henri de Toulouse-Lautrec taking up poster commissions. As the new century dawned, posters grew in popularity and their design became an increasingly respected art form. 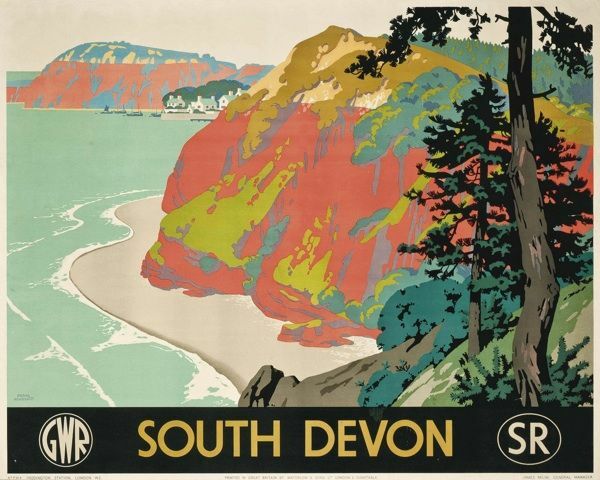 Early twentieth-century travel posters were often commissioned by rail lines, and later airlines, to advertise their mode of transport using images of exotic destinations. Poster artwork varied in style as fashions came and went: art nouveau, art deco and modernism were key styles of the travel poster era. Finally, poster art gave way to photography in the 1960’s, as printing technology underwent another evolution. The art of vintage posters has experienced a renaissance in the last two decades, as new generations rediscover the illustrations and paintings of the past. 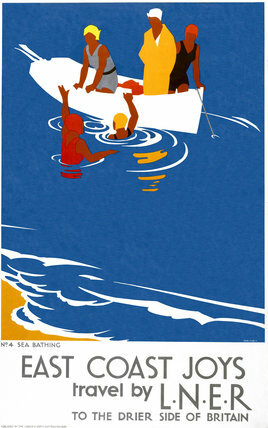 Original travel posters are now highly collectible items. In 2014, Christie’s sold Henri de Toulouse-Lautrec’s Moulin Rouge lithograph for £314,500, its highest-grossing travel poster in history. I grew up with this image printed on a set of coasters that my mum purchased while travelling in France. For those who aren’t millionaires yet, prints of vintage posters can also be purchased at much more reasonable prices. Allow me to introduce to you the mysterious talents behind travel posters of yore. This is by no means a definitive list and there are many artists unaccounted for – these are artists behind some of the most recognisable and collectible travel artworks. Joseph Binder (1898–1972), graduated from the Vienna School of Arts and Crafts before immigrating to the US. He created modernist masterpieces for American Railroads, American Airlines, and United Airlines such as these. Swiss illustrator Donald Brun (1909-1999) was a student of one of Switzerland’s first professional calligraphic artists. He created posters for Swissair among others. Californian illustrator Stan Galli (1912-2009) may have created your favourite 1950’s poster for United Airlines. British born designer Abram Games was one of the last of the great poster designers, as the art was lost to offset printing and photography. His early work was often for London Transport and Shell. After a stint in the British War Office during World War II, Games returned to posters for British Airways, Aer Lingus and EL AL. British artist Frank Newbould (1887-1951) attended the Bradford College of Art and Camberwell School of Art. He designed many posters for railways and shipping companies, before WWII at which time he became assistant to Abram Games (above) at the war office. David Klein (1918-2005) created boldly coloured modernist posters. The Texas native studied at the Art Center School (also known as the Art Center College of Design) in Los Angeles. He created illustrations for the U.S. Armed Forces during WWII, then went to live and work in New York City. He created most of his travel-related work between the mid-1950’s and 60’s. Klein’s commercial art includes these memorable commissions for TWA. 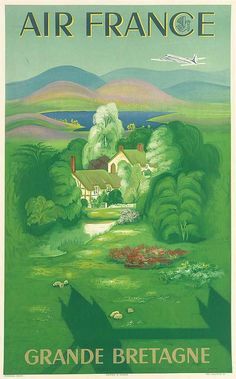 British freelance illustrator Maurice Laban (1912-1970) created posters during the 1940’s through to their dying moments in the 1960’s. 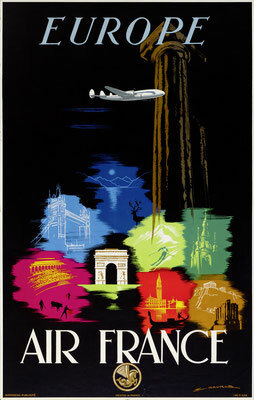 His vibrant posters for BOAC/Qantas were printed by silkscreen technique and made use of fluorescent opaque inks. The graphic design duo of Jan Lewitt (1907-1991) and George Him (1900-192) came out of the early 30’s in Warsaw. They relocated to London and worked together through to 1955. Fred Ludekens (1900-1982), was an American artist and illustrator. The Californian had no formal training and worked initially as a billboard painter. Ludekens produced work for magazines and other media. 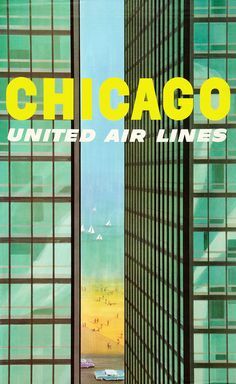 He created a series of posters for American and United Airlines in the 1950s. Harry Rogers (1929-2012) was an Australian designer who created several series of Qantas posters from the 1950’s through 1970’s, utilizing techniques such as paper cutting, collage and watercolour to define each campaign. French graphic designer Bernard Villemot (1911-1989) is associated with his work for Air France, Bally, Perrier and Orangina. 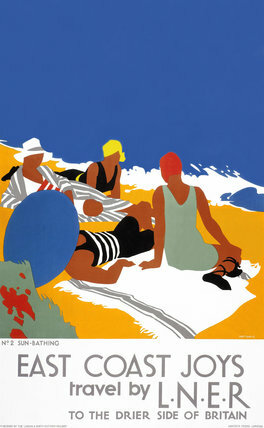 Villemot initially studied with master art deco poster artist Paul Colin. His work has been in high demand since his death in 1989. 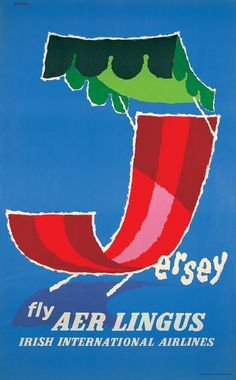 Edmond Maurus designed art deco posters for French airlines Air Union and Air France between 1925 and 1955. The French artist studied at the Germain Pilon School. Albert Solon (1897-1973) was also known for his art deco posters. The self-taught artist who became a cartoonist, created posters for airlines during the 1920’s and 30’s including: Farman, SABENA, Air France, Luft Hansa, Imperial Airways, KLM and l’Aéropostale. American artist Frank Soltesz (1912-1986) studied at the Art Institute of Pittsburgh and went into newspapers and advertising. The president of TWA in 1945, Jack Frye, offered Soltesz a job creating magazine advertisements which were seen in publications such as Life, Esquire, Sports Illustrate, Forbes, Fortune and Time. 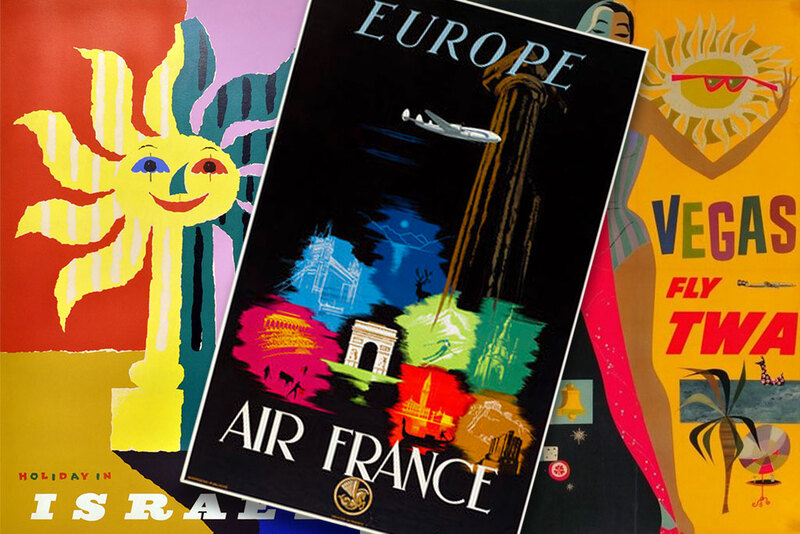 French painter Vincent Guerra is largely a mystery, but his work for Air France and Aerovias Guest after WWII are notable contributions to poster design. Albert Victor Eugène Brenet (1903-2005), who was born in France and studied at the Ecole des Beaux-Arts in Paris. He travelled for magazine LÍllustration and was appointed official artist for the three French military branches during WWII. Post-war he went into commercial illustration including advertising posters for airlines. Joseph Feher (1908-1987), a Hungarian born and trained artist, studied at the Academy Bella Arte in Florence, Italy and Bauhaus, Germany. He also obtained a scholarship to the School of the Art Institute of Chicago in the late 1920’s. From there, his work in commercial art and portraiture began. Feher taught in Chicago and at the Academy of Arts in Honolulu, Hawaii. He was also flown around the continental United States by United Airlines, to paint watercolours of cities for ads and calendars until about 1949. Italian painter Vittorio Grassi (1878-1958) started out at the Bank of Italy, testing typographic techniques as a means of counterfeit prevention, while he practised his landscape painting. He later moved into commercial work, designing stamps and posters for the Italian Government Tourist Board and the Italian Railroad System among other public agencies. 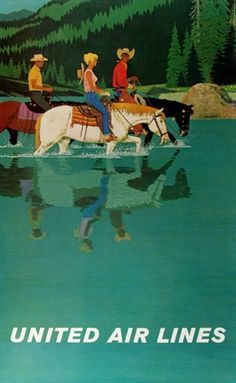 Otto Nielsen in the Danish painter who designed travel posters for Scandinavian Airlines (SAS) between 1954 and 1976 in his unique oil painting style. Parisian born artist Jean Even (1910-1986) studied at the Ecole Boulle and Ecole Nationale Supérieure des Beaux-Arts. Even favoured gouache for its matt colours, speedy drying and compatibility with light paper, all qualities excellent for travel. Another Air France favourite is Lucien Boucher (1889-1971), whose design career began at the Ceramique de Sevres. He debuted a the Salon d’Automne in 1921 before becoming a member two years later. He exhibited at the Salon de L’Araignée in 1924 through 190. Boucher produced lithographs, wood engravings and water colour drawings. In 1935 he began working for Air France and gained a reputation for his planispheres – a flat representation of the earth. Robert Falcucci (1900-1989), was a French illustrator and painter who studied at the Ecole Normale Superieure des Arts Decoratifs, Paris. Falcucci spent time directing magazine advertisements for Renault; illustrated a cover of L-Illustration magazine; and worked with couturier Paul Poiret. Arguably, his best known work his program artwork for the Monte Carlo Rally, and posters for rail line Paris-Lyon-Mediterranean (PLM). Another Australian, James Northfield (1887-1973), was educated in Melbourne. As a commercial artist, Northfield created posters for the Australian National Travel Association to promote Australian destinations to domestic and overseas audiences. Georges “Géo” Dorival (1879-1968) was a French poster artist who also specialised in glass plates and shadow puppet theatre. He studied at the National School of Decorative Arts in Paris. His best-known travel work includes posters for destinations such as Venice, Cote d’Azur, Mont Blanc, Heyeres and Brittany, as well as the railroads such as the Chemins de Fer de l’Etat. British artist Tom Purvis (1888-1959), attended the Camberwell School of Art. He worked in advertising agency Mather and Crowther before branching out on his own as a freelancer. Between 1923 and 1945 he created over 100 posters for London and North Eastern Railway (LNER), depicting the rail lines destinations in bold, flat colour with little detail. 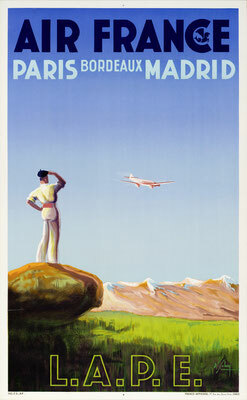 What is your favourite vintage travel poster? Drop a comment below and let me know. I hope you’ve enjoyed getting acquainted with the artists that inspired travelers of yesteryear and found a little duende of your own.